According to witnesses, the man shouted “Allahu Akbar” as he mercilessly started the massacre. A lone gunman recently attacked Reina, a popular celebrity nightclub in Istanbul, Turkey just an hour after the beginning of 2017 leaving 39 dead and 69 more injured. Reina nightclub is a popular destination for both local and foreign customers and since it was New Year’s Eve, up to 600 people were believed to be present at that time. Reina Nightclub is a popular destination for some Hollywood celebrities like Uma Thurman, Salma Hayek and Paris Hilton. The unknown assailant allegedly arrived at the scene armed with a Kalashnikov rifle, and first shot a policeman stationed at the door. The officer had been later identified as Burak Yildiz, 21 years old. Yildiz only started working as an officer ten months ago. Police Officer Burak Yildiz, 21 years old, only started working as a police ten months ago. A CCTV footage shows the moment the gunman entered the club and just started shooting at the oblivious party goers. Some witnesses claimed that they heard the man shouted, “Allahu Akbar” as he mercilessly started the massacre. The club owner, Mehmet Korcarslan said that they received warnings of possible terrorist attacks, thus they stepped up the club’s security prior to the incident. However, it proved to be ineffective as 39 people, fifteen of which were foreign nationals, lost their lives during the terror attack. Some of the terrified club goers even had to jump into the Bosphorus River to save themselves. President Tayyip Erdogan of Turkey condemned the attack and vowed to fight to the end all forms of terror attack from terror groups and their backers. He added that the incident was trying to create chaos and demoralize the citizens of his country. Turkey is no stranger to terrorist attacks from groups such as ISIS and Kurdish militants. 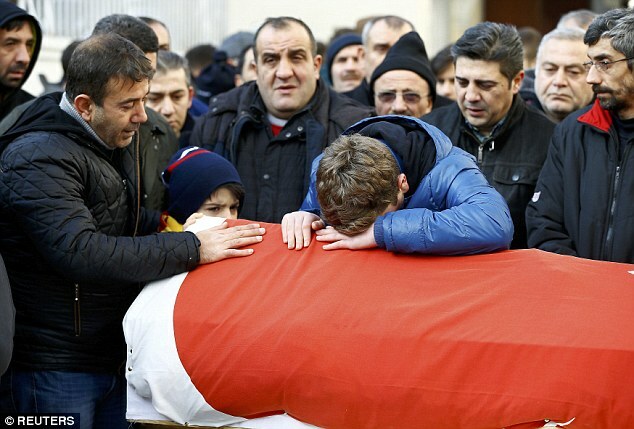 A young boy breaks down on his family member's coffin. Funeral rites have already started for the deceased victims while their families grieved their unexpected death. As an Islamic tradition, Muslims should be buried as soon as possible after their death. Apparently, carrying a Galaxy Note 7 is the equivalent of carrying a bomb onboard. Perhaps it is without any exaggeration when we say that the Samsung Galaxy Note 7 is the most ‘explosive’ device released in 2016. This, of course, is quite literal since the company recalled them because of several reports of explosion. Meanwhile, the internet has been merciless about the mistake and netizens everywhere posted the harshest and most hilarious reactions to the exploding gadget. Buyers, beware of fake ‘plastic’ rice! Nigerian authorities have recently confiscated an estimated 2.5 metric tons of alleged fake rice. According to reports, the Nigerian Custom Service was able to seize 102 bags of Best Tomato Rice after being alerted by a concerned customer. Although the health ministry has issued a statement encouraging citizens to stay calm since no solid proof has yet confirmed that the rice was fake or made from toxic chemical substances, the National Agency for Food Drug Administration Control hasn’t released their investigative report yet. Meanwhile, Mohammed Haruna of the Federal Operations Unit, described the rice as ‘plastic’ during a press conference in Lagos, Nigeria. A 100-ton pile of garbage, including medical and household waste, had washed up near a drinking water reservoir on the island of Chongming in Shanghai, China. The said place is home to approximately 700,000 people. Although officials have yet to confirm the culprits, it is suspected that two ships have disposed of these wastes somewhere upstream in the Yangtze River. The rubbish has since drifted downstream towards and has now collected around the Dongfengxisha Reservoir, one of the four primary water reservoirs of the city. Fortunately, water tests reveal that the drinking water has not been contaminated and that it is still safe to drink. Furthermore, officials say that the water inflow to the reservoir has temporarily ceased while testing and clean-up efforts remain underway.